Our action planning for the rest of this academic year revolves around three main topics. 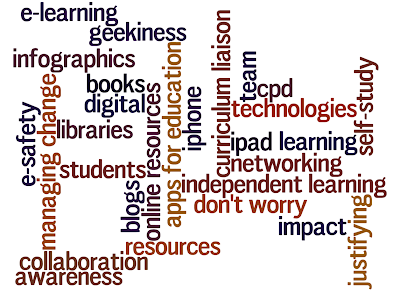 Promoting and developing learning technologies especially to support self study. Demonstrating effectiveness and impact is difficult because first of all you have to get over the idea that a learning experience shouldn't be measurable - that it should have value for a student but it is not always possible to quantify it. This is quite difficult as as an educator you want to believe in an inherent value but as a manager you have to have evidence Then you have to find a method of measuring - this is not easy in eLearning / Learning Resources as you don't have a ' success rate' as such. Therefore the only way is to have statistics and data recording what you do, which shows an improvement year on year, which can be compared to other institutions and can be verified by an external framework and by peer review. I think that eventually there will either be a way that it is inspected as part of the curriculum it supports or that it will be seen as essential and therefore not measured at all. 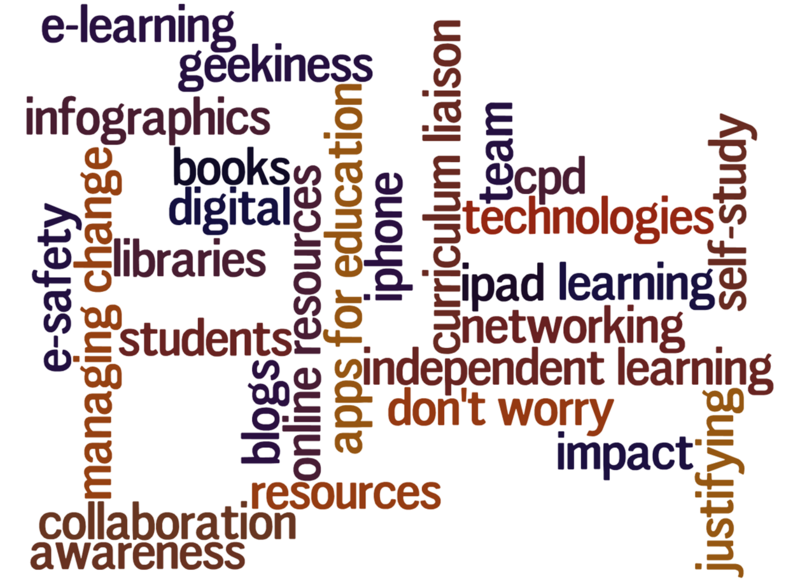 In the latter case, eLearning depts, learning resources depts and libraries will not exist as separate entities but be absorbed by the area, staff and students that they support - which may be no bad thing. In Sept & Oct we do a large number of LRC/IT inductions for students. This academic year we delivered to more than 3000. The sessions are very useful and although time consuming are quite enjoyable to deliver. It is fairly fast paced and we do quite a few each day so the momentum carries you through. In January it is different - not as many, in fact only a few. So it is like starting again each time and remembering what to do. Last term a working group was set up in College to look at student behaviour issues. In general this academic year there had been more than the usual number of incidents of bad behaviour and also it was felt across the College that behaviour in general was of a lower standard. The attitudes of students has been poor and disrespectful to staff both teaching staff and support staff. We had some incidents in the LRC of students behaving inappropriately and disrespectfully. As ever it is a small minority of students but nevertheless it does have an impact and it is important to recognise the issues. The first meeting was a general meeting with representatives from across the College staff and was an opportunity to raise issues. For the second meeting a working group was set up in order to be more focused - a task and finish group! Some suggestions were put forward of ways to ensure students would be wearing their ID cards on the official college lanyards. This was agreed as an important way of ensuring that students can be recognised as members of the College. Vending machines are an area that was highlighted regarding vandalism Security was also discussed in order to ensure a safe learning environment. The next meeting which was today, staff reported back about incentives that are going to be introduced to incentivise students to wear their ID cards and lanyards. These include marking registers with a lanyard present mark so that students can be entered into a lanyard lotto - free meals from the cafe for a week, spot 'prizes' for lanyards and good behaviour and also linked to merit awards. 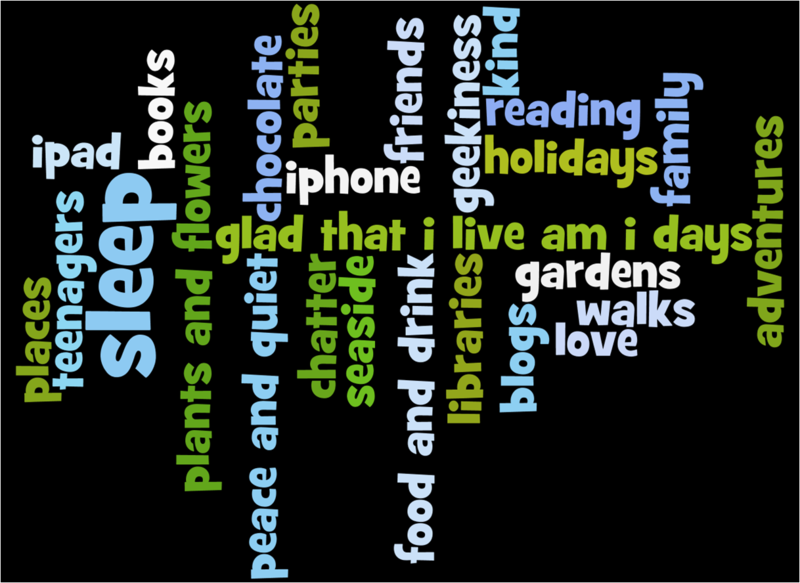 I have created two word clouds using Wordle for my New Year Resolutions - one for home/everyday life and another for work. 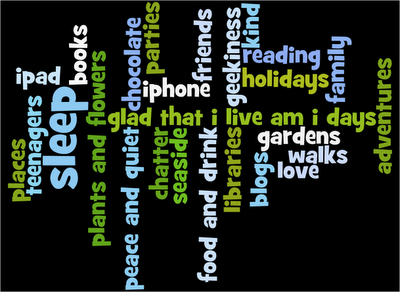 There is some overlap as quite a lot of my work stuff I enjoy doing anyway and quite a lot of places and resources that I discover or visit are relevant to e-learning/libraries/technologies etc. The black background with blue and green text is the home one, the white background with brown and blue text is the work one.